(From L-R): Anthony Tan (General Manager, CPH), Halimatu Yushawu - Eco-Tourism Philippines 2018, Johnny James Tan (OIC, Maranaw Hotels & Resort Corporation), Berjayneth Chee- Miss Water Philippines 2018, Lucio “Bong” Tan Jr. (Director, CPH), Silvia Celeste Cortesi – Miss Earth Philippines 2018, Peachy Veneracion (VP & Project Director, Carousel Productions, Inc.) and Ritchie Ocampo (Team Manager, Carousel Productions, Inc.) pose during the MOA signing. CPH will also play host to the National Costume Competition (October 11, 2018) and Figure and Form Preliminary Judging (October 29, 2018). 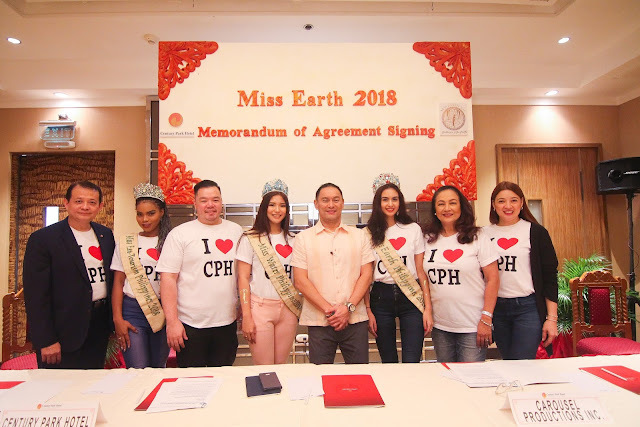 The international pageant will be held on November 4, 2018 at the Mall of Asia Arena.